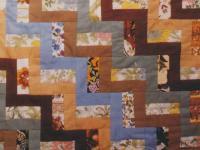 In 1974, my husband and I bought an old farm in Missouri from Ida Vohs, a 79 year old woman who made quilts. She had closets full of quilts, and I was entranced when she got them out and showed them to us. At that time I was a painter, and also dabbled in a number of other mediums. 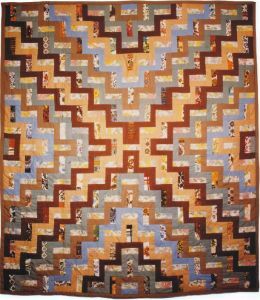 I had been sewing since I was ten years old and quilting seemed like one more fun thing to try, so I bought a book on quilts from the literary guild. 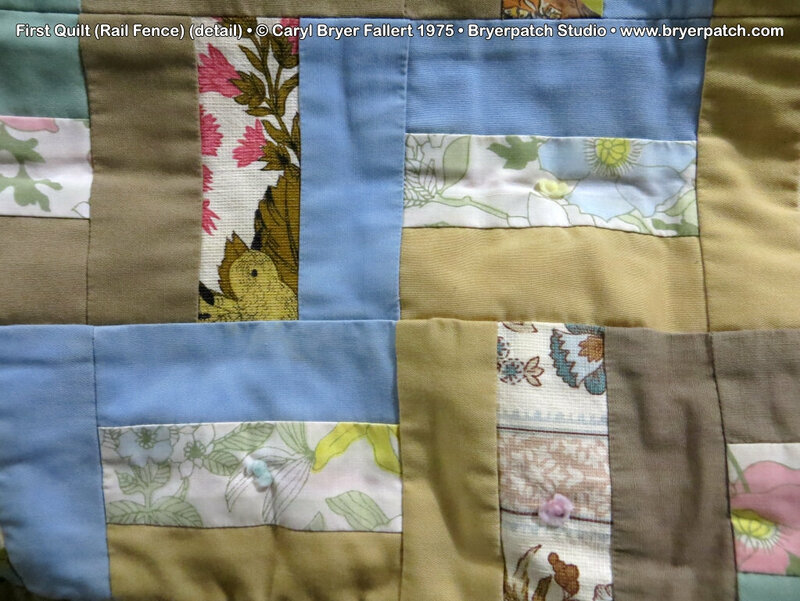 In that first book was a picture of a quilt called "Rail Fence". It seemed pretty simple, and I figured I could make it without a pattern. So I gave it a try. 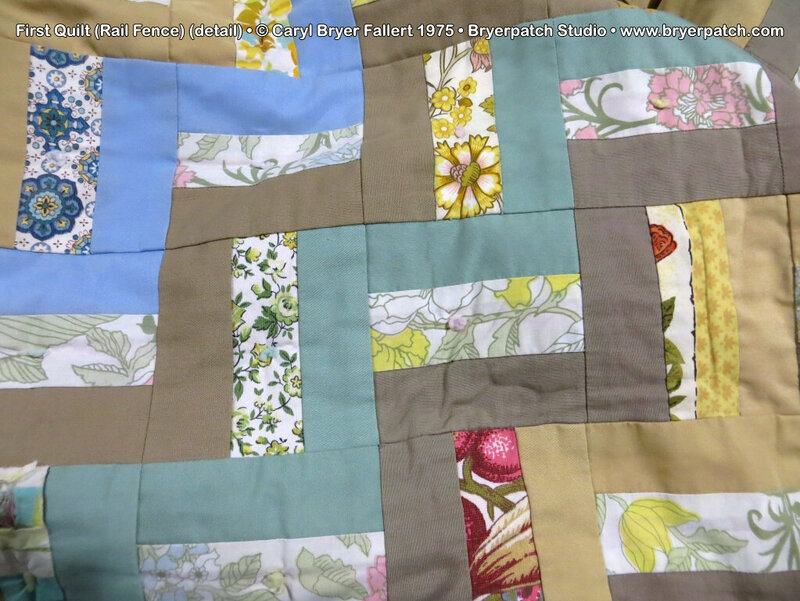 This is my very first quilt, made in 1976. I didn't know very much about quilts or how to make them, so I made a single template out of cardboard and cut out each piece with scissors. The print fabrics are drapery samples from a book of discontinued wallpaper samples. The solid fabrics are heavy "trigger" cotton/poly blends. I laid out the pieces like a knitting pattern and began to sew. The whole quilt was made with 5/8" seam allowances, and when I started to sew the rows together I discovered that accurate cutting and seaming might have made the task easier. I didn't know how to quilt, so I tied it with knitting yarn, using a sheet as a backing. Instead of batting I used an old, very used-up quilt that had been made by my husband's grandmother. It was filled with layers of thin, white, wool, knitted fabric, which I can only conclude, must have been worn out long underwear. 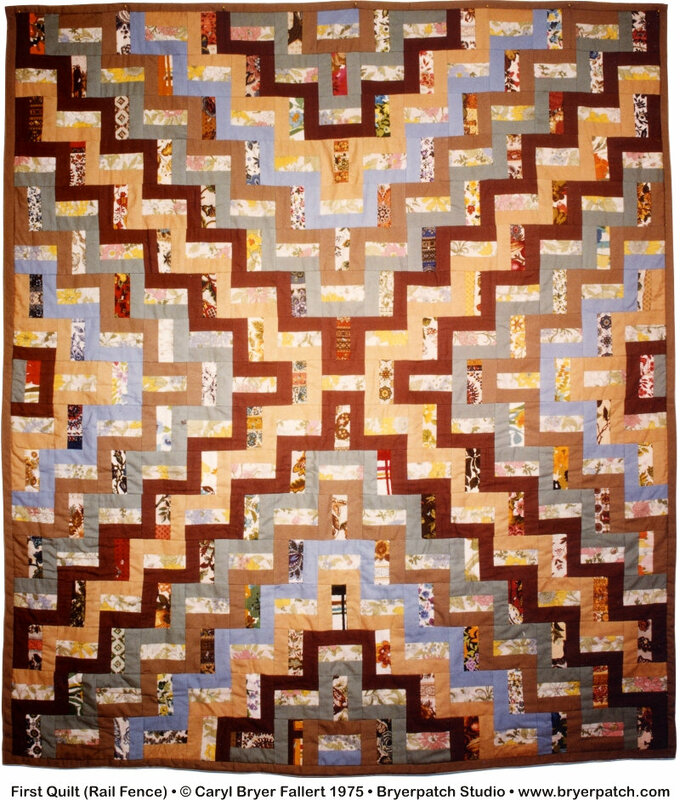 The finished patchwork comforter weighs about fifteen pounds, and is very warm even on the coldest nights.